Want to know how to get TONS accomplished and meet your goals in the new year? It starts in the planning stages, right now. And don't miss the fun giveaway at the end! What went well, why? What specifically made that a success? What did not go well? why? How can I improve this year? What did I NOT do this year, that I wish I would have? How can I make that a reality this year? Which specific activity had the highest ROI (return on investment)? What did I achieve that I don’t feel got sufficient recognition? What’s on your all-time bucket list? I want to visit all 50 states in the USA. I want to celebrate a wedding anniversary in Greece, one year… What is it that you want to do? Is there any way you can take steps toward reaching that goal this year? Plan for it. There are things in our lives we all HAVE to do, like it or not. Taxes. Income/expense reports. Holidays with the family. Business trips. Make a list of the non-negotiables for next year’s schedule and get them on your calendar now. Then, you can plan all of your flexible events around those “must-do” events, making sure you give yourself enough room in the schedule to do all things well. If you don't have a good tool for this, I recommend the quarterly Blog Well Planner. It's laid out in such a way that planning for those goals and around the non-negotiable to-dos is easy. Do you want to hit $1000/mo income? Do you want to release 4 new products? Do you want to loose weight and change your diet? Set the goal and create action steps and deadlines to get there, planning for it around the non-negotiables. The action steps and measurable-ness is what makes it a “goal” and not just a dream. Be sure to plan regular goal check-in deadlines into your calendar too. If you set a “goal” with action steps and measurability and then forget about it, well, now it was just a great idea. Goals require commitment, follow up, check-ins, evaluations, measurement. I also try not to set more than 3-5 big goals in any one area for the year. Then I choose one big goal or project per month. It’s a great way to focus and really accomplish things. A great resource for planning and tracking goals is the book 12 Week Year by Brian P. Moran. Fits great with the Blog Well Planner as well! Do you have a family? Do you have people in place as a support system? Do you have part-time or full-time help? Give them a heads up of your schedule and goals for the New Year. Get everyone on the same page. Let them know the expectations, goals and action steps you’re planning. It’s great for increasing the support you get, and inside a business, it also improves morale, unity and communication. A great place to start the new year from. If you don't have a support system, you can join ours at The Blog Connection! We'd be honored to help you over humps, hold you accountable, and cheer on your victories this year. Click here for a free download planning form. Really great post! I actually practice many of these tips myself! Thanks so much for sharing. 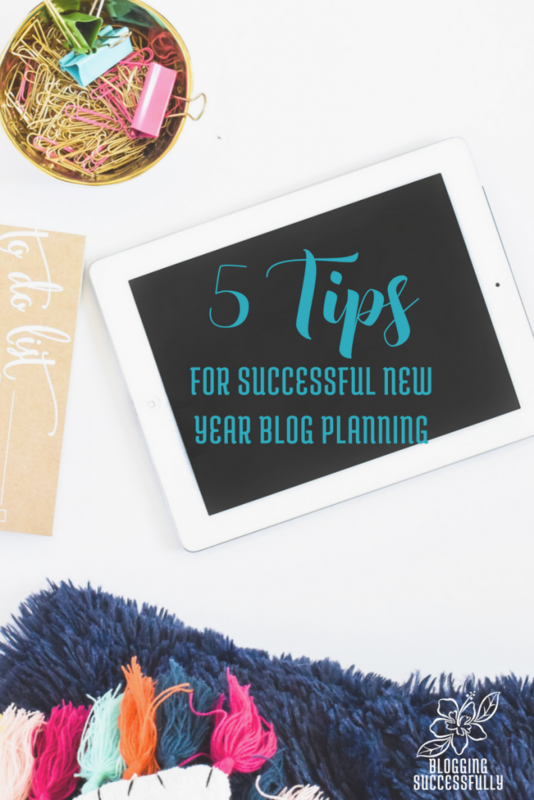 I love hearing how other bloggers get ready for the new year! Thanks for stopping by Mandee.